Even in houses where there is a lot going on in terms of the design, individual rooms still have a focal point. This is the area of the room that commands the most attention. If you're in the process of planning a custom home and want to come up with the ideal focal point for one or more of the rooms, a fireplace is a great option. One reason that this addition works so well is because it can be made from different materials. Wood, brick and stone are the three most popular choices. Another advantage is you can go with a modern or more traditional style. All of those options mean that even if you have multiple fireplaces in your home, you don't have to settle for duplicating the same one. Instead, you can be as unique as you want. And to top things off, it's hard to beat the comfort provided by curling up near a fireplace on a cold night. Where Can a Fireplace Go? When it comes to positioning a fireplace, you have several different options. The first is to put it in the corner of a room. For a room that's on the smaller side, this is ideal because it allows you to get all the benefits of a fireplace without taking up a lot of space. Another similar option is putting a fireplace directly into a wall. The key to making this work is taking the time to decide which wall is going to work best. By thinking about how you're going to arrange the rest of the space, this will ensure that the room flows just as well as you hoped. 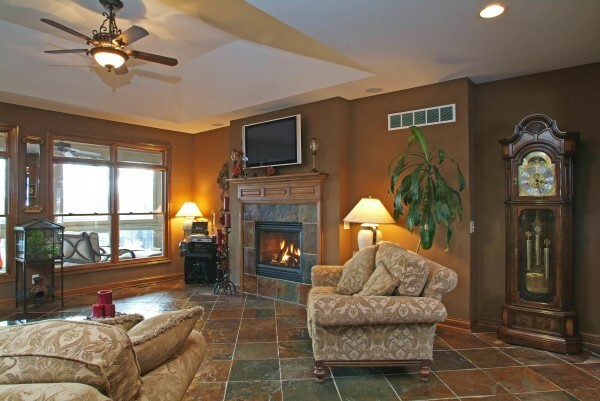 Not every room requires you to be as efficient with your use of fireplace space as possible. In fact, some rooms may have a surplus of space. If this is the case with a room you're planning on including in your custom home, putting a fireplace in the middle of the room may be exactly what the room needs. What's cool about this option is while it doesn't cut off the space, it does add depth and structure. Additionally, using a column that allows you to have a fireplace that goes all the way through means that regardless of which side of the room you're on, you'll be able to enjoy looking at it. If you enjoy hosting parties and spending time in your backyard, having a nice outdoor fireplace can really add to the visual appeal of this space. By opting for an outdoor fireplace, you'll have something that you can design the rest of this area around. This will allow you to always enjoy your backyard to the fullest. Like the idea of one or more fireplaces but still aren't sure about their exact placement? By working with an experienced custom home builder, you can be confident that you'll be 100% happy with the design that's ultimately used.